Is there any value in New Age thinking? Defining 'New Age' is difficult - the term has been appropriated by all kinds of cults. In my view, the New Age movement was a reaction against the mistakes of western civilisation: an heir to utopian socialism. 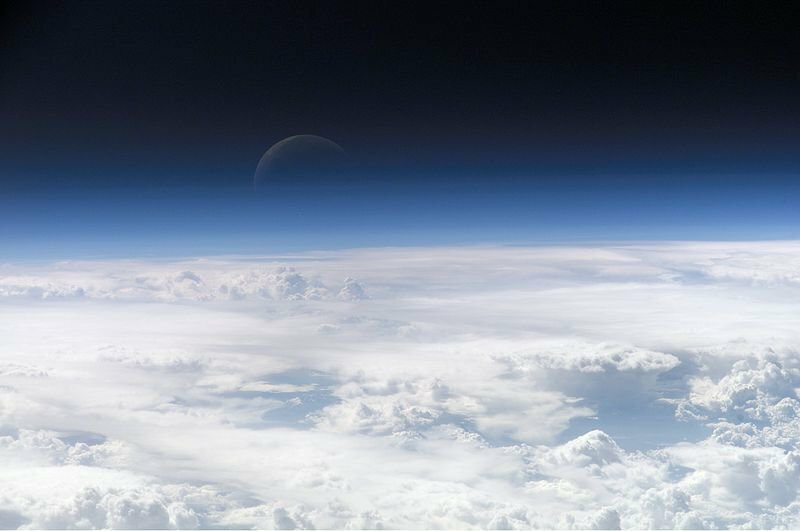 The top of the atmosphere. Credit: Wikipedia. Some rights reserved. I’m a big fan of Rushkoff’s ideas, but this condemnation is far too one-sided. In my view, the New Age was a necessary reaction against rationalist excess, and it paved the way for contemporary explorations of spirituality that are rooted in human solidarity. It’s easy to see the partial truth in Rushkoff’s contentions, which remind me of my own experiences with the Rajneesh community in my mid-twenties. The spiritual techniques of the movement, such as dynamic meditation, aimed to liberate the repressed energies of the body and the emotions, but they also worked against critical self-reflection in the western tradition and the “witnessing the mind” meditation techniques of the east. This was a form of liberation from below for sexually repressed post-Christian individuals like me. We became more capable of joy, but also more selfish and disconnected from any community other than our own. The Rajneesh community aimed at obtaining more spiritual experiences, with the final goal of ascending to mystical unity. What we lacked was any horizontal orientation, any real connection with other members of society. Our spirituality was thoroughly individualistic, yet individual autonomy was made subservient to the organization and its guru. I’ve often thought that Rajneesh prepared us to be followers of neo-liberalism, in which autonomy always exists in the context of corporate hierarchies. His devotees were certainly liberated in one sense: from any feeling of solidarity with their fellow human beings. Instead, we aspired to a spiritual elite of entrepreneurs in the making. Nevertheless, it would be wrong to tar the whole New Age movement of the late 20th century with the same broad brush, since it reflected many contradictory realities. Overall it played an important role in the evolution of human culture from the 1960s onwards, as necessary as the Romantic Movement a hundred years before. Defining 'New Age' is of course a difficult thing to do, since it means so many different things to different people. The term has been appropriated by all kinds of cults, and has become a permanent marketing concept in bookshops, especially in the Anglo-Saxon world. In my view, the essential characteristic of New Age thinking was that it was a corrective reaction to the excessive rationalization and mechanization of western life, the dissociation between desire and reason that lies at the basis of civilization in the west. This reaction was both necessary and exaggerated. It appeared as a new sensibility across alternative and complementary medicine, ecological awareness, and greater openness to non-traditional spiritual paths and alternative methods and lifestyles in the fields of communal living, architecture and education. New Age thinking was an attempt both to heal the self and to re-enchant the collective through connections with the natural world and the world of spiritual experience. The flowering of the New Age coincided with the defeat of the 1968 social and political movements. Many people turned their attention inwards, but at the same time they felt obliged to adapt to a world in which they could no longer recognize themselves. They continued to live out their values and make concrete changes where they could, but on a smaller scale as individuals, families and communities. New Age thinking emerged at the end of a long boom in the global economy and the continued commodification of life under capitalism. Traditional social technologies of control such as schools, churches, militaries and prisons lost some of their force, especially in the Western Christian traditions. One of the first tangible benefits of the New Age was to reintroduce the importance of consciousness to the western world and to recognize that spirituality was not just a matter of belief but of experience. New Age traditions contained a vast array of methods that could open up new vistas of perception. For many people, they created an opportunity to re-integrate these methods into their lives and experiment with different alternatives. New Age thinking also provided a vehicle to overcome the separation of mind and body that was characteristic of western individualism prior to 1968. In many ways it represented what Freud called a “regression in service of the ego”, a return to repressed areas of bodily energy, instincts, emotions, mind and consciousness. Unfortunately, it frequently stayed in that regressive mode. New Age thinking was too anti-rational, too disdainful of the critical subjectivity that was one of the hard-won features of the West. But to paraphrase Lenin, it was probably a necessary “infantile” stage in the development of alternatives. It also offered avenues for people to work on themselves, a positive orientation in an otherwise dark period for social change. In other ways, New Age thinking was an heir to utopian socialism. Given the difficulty of changing society in radical ways at the macro level, people began to change their own lives by abandoning blind trust in the mechanistic approaches to the human body that were espoused by Western medicine; and by leaving aside the knowledge-stuffing, rote-learning style of education they were fed in order to treat children as whole persons. These changes have made the world unrecognizable from thirty years ago. Whatever the negative features of the neoliberal age, many institutions have become more humane, more egalitarian, more respectful, and more attuned to the whole individual. People have changed, institutions have evolved, and many small-scale communal experiments have yielded valuable learning experiences even if they have failed to change the bigger picture. At a time when the left was disintegrating and many social gains were undone, New Age thinking provided a banner under which millions of people continued their concrete efforts for personal and social change. Nevertheless, this thinking was also reactionary in its exaggerated rejection of 'cognicentrism' - the Western focus on the thinking mind alone. It went too far in dismissing the role of critical intelligence. Instead of being integrative it was often regressive, a 'liberation' where selfish desire could reign unchecked. It fell prey to cults, mindless anti-modernism and extremism in the fields of diet and medicine that refused to see anything positive in western science. Spiritually, it had a romantic, rosy-tinted outlook that served to compensate for a life of dreary reality in which hyper-competition was degrading the quality of human relationships. Finally, being born in an age of hyper-commerce, New Age thinking took on the trappings of the market, and it started functioning in ways akin to market logic. It encouraged people to behave like consumers in picking and choosing what they wanted. It became too focused on the individual and neglected processes of social change. Many of these trappings, which sometimes verged on exploitation by scumbag cults and gurus, were incompatible with authentic spirituality, which must be open-ended and participative, not based on a market model of paid experience. If both New Age thinking and anti-spirituality are exaggerated reactions to each other, the task now is to find a critical subjectivity that rejects the 'dictatorship of the mind' – the belief that societies already know the direction or end-point in which they are heading. What would that consist of? For me, the key step is to reject the view that sees spirituality in terms of individual experience alone, and replace it with a spirituality that functions around relationships between different people. In pre-modern times, people lived as members of communities with roles that were largely externally defined; in modern times they live as atomized but autonomous self-directing individuals who are bound together through social contracts and institutions. Post-modernity, seen as a critique of neoliberal capitalist structures, sees the individual as increasingly fragmented, and it has developed a strong critique of all the forces that have shown us that we are not nearly as autonomous as we think, including language and power. But this process has also left us stranded as fragmented individuals without much sense of a direction, forever deconstructing realities but rarely reconstructing them with much success. Therefore it is time for something new. In an age of peer production, in which more and more individuals are socialized through the internet, a relational spirituality can be born among people who cooperate with each other in a wide variety of networks. As we become engaged in communities of our peers that produce collective value, the horizontal dimension of spirituality returns to center stage. In this new context, the view of human beings as fragmented is no longer a reason for despair. On the contrary, our inner multitude of interests is what enables us to contribute to a range of different, peer-driven projects. The individual psyche can then be constructed through each person’s contributions to the life of the whole, and through the recognition they receive from the communities in which they take part. Today, individuals are no longer defined only by their membership in traditional communities or rigid roles. In my world, for example, an increasing number of people see themselves as contributors to open-source software systems like Linux rather than employees of Microsoft or Google. In this context, the key to an integrated self is to construct a rich identity of contributions that stem from active participation in many different communities. No longer New Age or Old Age but building on elements of both, a relational spirituality could form a cornerstone of the contributive societies on which the twenty-first century will be built.